There are so many occasions that call for a quick and easy tray of food for a crowd: club meetings, dinner parties, team celebrations after a big game…if you’re in charge of the menu, finding a Paleo substitute for the typical tray of sandwiches or pile of pizza boxes is a tall order. 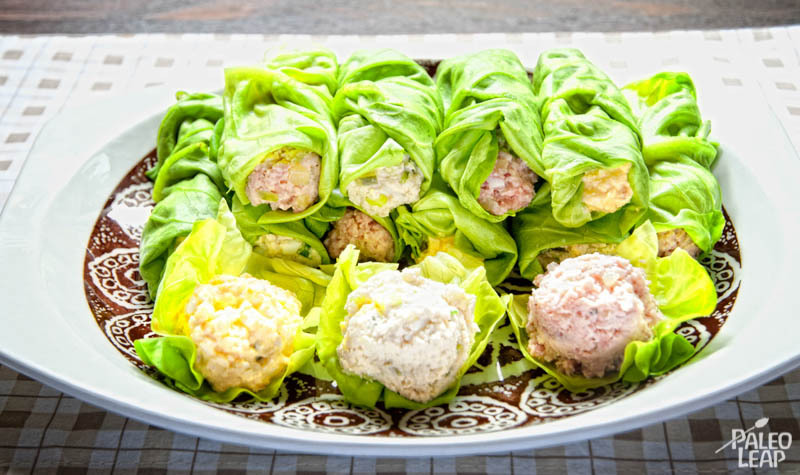 Here’s an answer for that problem: a trio of salad recipes that can easily be folded up into any kind of lettuce leaves and served as mini-wraps (for extra pizzazz, garnish each roll with a colorful toothpick). The lettuce sandwiches are easy to eat as finger food, and having three different flavors ensures that everyone can find something they like. If you don’t use any animal fat in your mayonnaise, the egg salad is even vegetarian. Needless to say, all three of the recipes are much healthier than anything you can order from a fast-food joint or pick up at a restaurant deli counter. All the salads require some Paleo mayo, so make sure you have a jar ready before you start; if you don’t, it’s simple enough to throw together a quick batch. 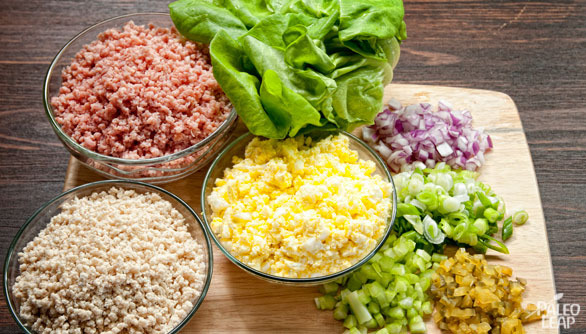 The lettuce can be any variety – I usually go for Boston lettuce, since it has a nice crunch and a convenient size. Butter lettuce is also great for wraps, since the leaves are very flexible and not prone to breaking. If you have some kind of Paleo bread or Paleo crackers, you can also use that instead. In a bowl, combine the chicken, the green onions, the celery and the egg and toss gently. Add the mayonnaise. Season to taste, and stir to blend well. Refrigerate 15 to 20 minutes. Mash the eggs with a potato masher. Add the mayonnaise, paprika, green onions, and salt and pepper to taste. Stir to blend well. In a bowl combine all the ingredients. Season to taste, and mix well.